And color me baffled at what they consider an adverse case for housing prices. They consider a fall of housing prices, as measured by the Case-Shiller 10-city index, of 27 percent from 4th-quarter 2008 levels to be as bad as it could get. But the CS-10 were around 30 percent overvalued relative to rents or overall consumer prices in 2008 Q4 — so their worst case is for housing prices to fall to historical norms, with no overshooting. What a letdown. 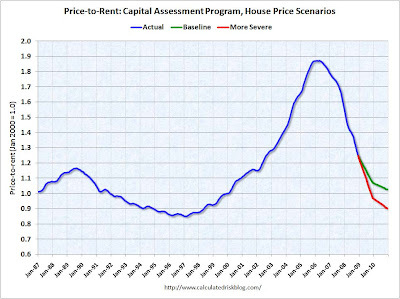 Leaving aside that price-to-rent isn't the best metric (price-to-income is better), Krugman is wrong that the adverse scenario only assumes a return to historical norms for house prices, as Calculated Risk's graph of the baseline vs. adverse scenario shows: The baseline scenario assumes a return to historical norms (the price-to-rent ratio usually fluctuates around 1.0). The adverse scenario assumes that house prices overshoot on the downside. It's important to remember that for the stress test to be successful, its worst-case scenario only has to be worse, or on par with, what investors believe is the worst-case scenario. The Treasury is essentially trying to induce a private-sector recapitalization of the major banks. The point of the stress test is to convince investors that the banks will survive even without their capital, and even under worst-case scenario assumptions. If investors are convinced of this, then the banks will probably be able to raise private capital. And once the banks raise private capital, they'll be able to withstand a real worst-case scenario (the kind Krugman envisions)—crucially, without more taxpayer money. Nice to see the results of this experiment. I found it quite amazing. Let's see how others are reacting to this finding. Very worthwhile write-up. Especially. the actual is an acronym accustomed to offer the mind. I would not have seen this alone. Will need to carefully examine outdated photos to find out this kind of characteristic.